SAVE or VIEW the file). The Truth Machine by James L. Halperin is now available as a free download for yourself and to share with your friends (just email the link to this page, or forward the entire book in MS Word format). 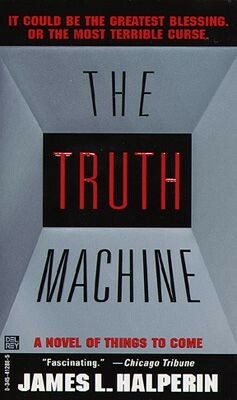 An international best-selling "futurism fiction" novel, The Truth Machine imagines a world logically extended from 1995 through the next half-century in which a foolproof lie detector is unleashed upon civilation, changing every aspect of human existence on earth and upending the life of its own creator. The Truth Machine has been translated into many languages, including Chinese, Spanish, Japanese, Serbian, and Hebrew. Over 300,000 copies have been sold since it was first published by Random House in 1996. Many readers claim to have read the book dozens of times. The Truth Machine is currently under development as a major motion picture by Lion's Gate Entertainment.